The lecture performance Purple Panic: 43 by Pınar Öğrenci is the last event in the series Revolt She Said – Decolonial and feminist perspectives on 68, within which we seek to reassess the production of narratives and historiography and to (re)tell the movements of this time from the perspective of their feminist, anti-colonial, diasporic, migrant, Jewish, and Black organizations. On September 24, 2014, 43 students from the Ayotzinapa Teachers’ School were kidnapped as they were going to Iguala to protest the discrepancies in school funding by the government; the kidnapping was a collaboration between the state and the mafia. The students planned to continue to Mexico City for the commemoration of the 1968 Tlatelolco Massacre during which 300 people had been killed in the run-up to the Summer Olympics in Mexico City. 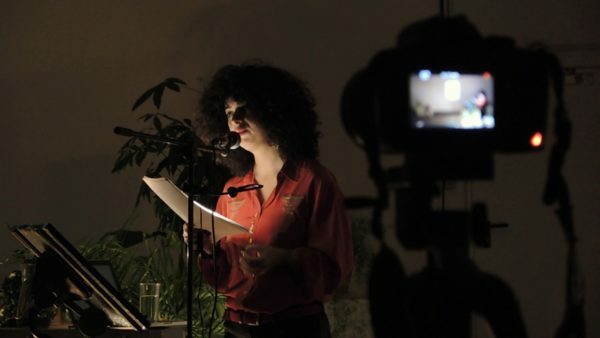 Pınar Öğrenci went to Mexico City at the beginning of 2015 for the De Las Fronteras Biennial and the R.A.T. artist’s residency program. 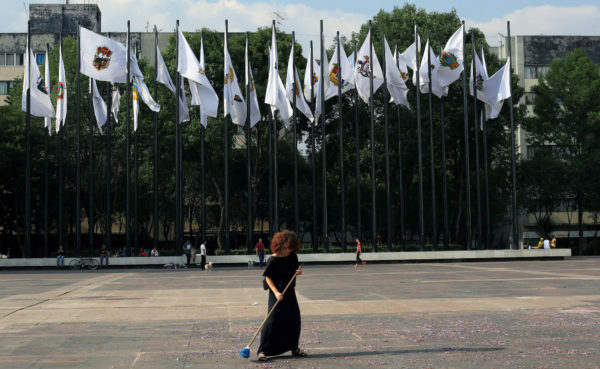 She swept jacaranda flowers on avenues which are important sites for Mexico City’s collective memory of the students of Ayotzinapa. The final part of her performance Purple Panic: 43 was realized exactly six months after the disappearance on Tlatelolco Square. The relationship between the disappearance or kidnapping in 2014 and the 1968 Tlatelolco Massacre is a striking example of the repetition of the cycles of state violence. This repetition can be related to seasons, symbolized in the jacaranda flower. Jacques Derrida theorizes the politics of hospitality. He argues that most hospitality is conditional, hinging on populations and sovereignty, limits and borders, and calculations of risk and management of resources. Derrida’s work focuses on the experience of foreign immigrants and refugees; but how does hospitality apply to citizens estranged in their own homeland? * Öğrenci takes this question as a point of departure to look at the violence inflicted by the Mexican State on its dissident citizens. The parallels between the university raids in Mexico in 1968 and contemporary human rights violations in Turkey motivate the artist. In preparation of the Summer Olympics in 1968, the Mexican government wanted to showcase a modern city for the international audience, forsaking its own citizens. Accompanied by the documentation of the performance, Purple Panic: 43, the lecture-performance includes texts that focus on the relationship between state violence and architecture. 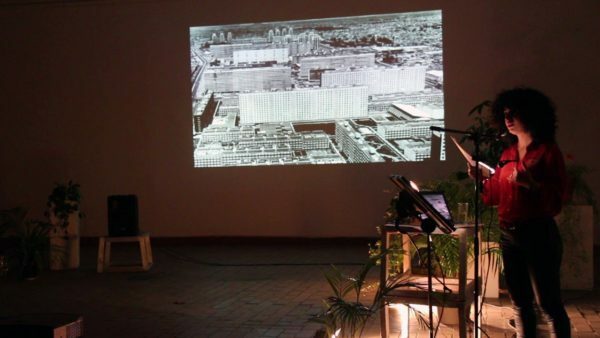 Through the histories of Palacio de Lecumberri, Hotel de Meksiko, and Nonoalco Tlatelolco, histories of buildings will serve as an attempt to understand the 1968 movement in Mexico. The artist tries to interpret Derrida’s concept of hospitality through looking at the spatial histories of a prison, a hotel, and a large-scale housing project. Often disregarded in histories of architecture, she makes visible the human stories of laborers, peasant immigrants, and students who, being forcefully displaced, were critical of the system. Revolt She Said is curated by Andrea Caroline Keppler (District Berlin), Dr. Katharina Koch and Dorothea Nold (alpha nova & galerie futura) in conversation with Karina Griffith (District Studio and Research Grant holder Decolonizing 68), Sharon Adler, Madeleine Bernstorff, Dr. Lisa Glauer, Dr. Natasha A. Kelly, Martina Kofer, Dr. Corina S. Kwami, Pınar Öğrenci, Dr. Peggy Piesche, Kelvin Sholar, Merle Ströver and PD Dr. Anja Zimmermann.